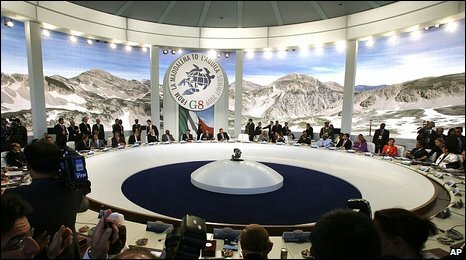 The G8 summit in Italy has closed with world leaders pledging $20bn to help boost food supplies in the developing world. There were also agreements among both developed and developing nations that global temperatures must not be allowed to rise to dangerous levels. BBC correspondents at the G8 give their analysis on the main developments. Follow the links below to jump directly to their analysis. Low expectations can be an advantage. The G8 has had much bad press in recent years, and the emergence of the other "Gs", as President Obama called them - groupings of G20, G5 and G14 - had threatened to undermine its exclusivity. What was the point of a G8 club, many were beginning to ask, which was too narrowly-based to tackle today's global problems and when it did reach a deal, never seemed able to live up to its own promises? At first glance, this year's gathering did seem more consensual than it has been for some time. But on broader diplomatic questions, the sands soon began shifting. The American and Russian presidents both arrived, basking in the warm glow of what appeared to be a ground-breaking summit in Moscow, crowned by a deal to get back to a new round of nuclear arms cuts. But in his final G8 press conference President Medvedev sounded a chilly note: Russian missiles could still be re-targeted to point at Europe, he warned, if President Obama did not cancel plans for that controversial missile shield in Europe. In the end, it seemed as though the main purpose of this summit was simply to take stock before the next global round of meetings. President Obama publicly warned Iran it had until the next G20 summit - due in September - to respond to an appeal to suspend its nuclear programme. Many leaders invoked the Copenhagen meeting in December as the real deadline when it came to a proper global deal on tackling climate change. So has the G8 had its day? President Obama seemed to hint as much, ruefully complaining there had been far too many summits already in the six months he had been in office. and see you again next year. Few people expected a decisive breakthrough on climate change at this summit. President Obama pointed out at the end of proceedings that the G8 was never really the right forum for that. Nevertheless, the meeting of the major economies forum he chaired did bring a greater meeting of minds and of joint political will than we have ever seen previously. The historic polluters - the industrialised countries who make up the Group of 8 - were able to join with the emerging economic giants in a shared acceptance that global warming must be limited to a maximum temperature rise of 2C. That could not have been taken for granted before all those leaders came to Italy. It helps bind India and China, in particular, into a process of restricting emissions of greenhouse gases - a process to which they have previously been highly resistant or even downright hostile. The US, under the new management of Barack Obama, has moved a long way too. His commitment to aim for emissions cuts of a whopping 80% by 2050, alongside the other G8 countries, does have its flaws. But it is a very big target, even if it is so far in the distance that it is quite hard to judge if really tough decisions will be made now to make deep cuts by 2020. That's what the UN scientists insist is necessary. The failure to agree an interim target for 2020 provoked the UN Secretary General into unusually harsh criticism. Ban Ki-moon told me at this summit that the G8 leaders of the rich world were failing to shoulder their "historical responsibilities". No wonder everyone agrees that it is going to be a very hard road indeed towards Copenhagen and the December UN summit meant to produce a new and binding global treaty. The final day of the summit was dominated by food, and a new approach to tackling hunger. It involves less emphasis on food aid and more on promoting the development of agriculture. And there is money on the table to fund the strategy - $20bn. Campaigners here generally welcomed the basic idea, but have reservations about whether the money being offered is enough and whether it is genuinely new. The big concern they always have whenever the G8 offers aid for something is whether the money will be diverted from other development programmes. Most say that in the immediate aftermath of the news, they don't know. But they will be poring over the figures to see if they can work it out. On the overall aid budget there was a great deal of criticism of some G8 countries ahead of the summit for falling behind on commitments they made at Gleneagles in 2005. Max Lawson of Oxfam says that European G8 countries made the biggest promises. But apart from the UK, he says, they are not on track to implement the aid increases they said they would by 2010. One of the communiques issued at this summit reiterates the importance of the Gleneagles commitments. But campaigners say some G8 countries are almost certain to fall short. Has the G8 done enough to help Africa? Are G8 climate targets realistic?